If you move quickly you could bag yourself a real bargain. 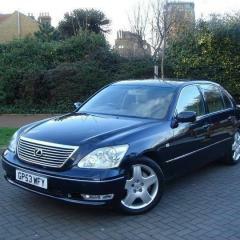 There's a 2003 LS430 on eBay with 143k and they're only asking £10,000! The thing that really makes it a great buy is the way it's left hand drive. Be careful not to get crushed in the rush! I assume that means you are going to really need the PWR boost to whip past lorries on single carriage ways having chanced your arm. Great for someone thinking if moving abroad to get away from our politicians and their total lack of running the country while arguing over (sorry for swearing), Brexit. Eh, what's that? Brex what? Presumably that's something new, I've not heard of it myself! I have just read a LADYBIRD book about Brexit. I laughed so much everyone in the Hospital waiting room kept looking at me !! Damn, the 430s sure are appreciating nicely. My 53 plate was £4400 just over a year ago with 91k on her. So assuming yours is the slightly less desirable right hand drive, I'm guessing yours must be worth £9,500- £11,000? And mine being a 2003 with 65k, well, shall we say £12,000? Even if it was right hand drive it would still be 6k more than it's worth. Strange how some try it on!